Opening hours: While businesses are usually open from 9am-10pm, some of them may close for midday between 12pm and 3pm. Most shops are open daily while others establish individual opening hours. 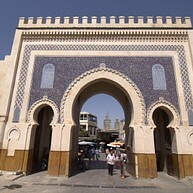 As the third largest city in Morocco, Fès has a vast cultural heritage and a historic value for the region, and in the three districts Medina, Fès el Jedid and Ville Nouvelle, an ancient past meets the modern world: the decades of French rule in Morocco have left a unique influence that is visible in the infrastructure and cuisine. Be prepared that you can easily lose yourself in the many sights of the maze-like and car-free Old Town that, on the other hand, is absolutely worth the adventure. As the Medina is not for tourists only, due to its integral part in daily life, and in conducting business, you can here experience the traditional life. 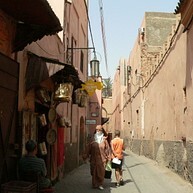 The 14th-century Jewish quarter of Fès has currently 160,000 inhabitants that live among and along its 9,500 streets. The various sites of Jewish heritage are well worth a visit but due to the maze of streets, it is wise to explore the mellah with an official guide. In the southwest corner of The Mellah and next to the Habarim Synagogue, a sea of white tombs stretch down the hill, and it is easy to spot which are the graves of rabbis. 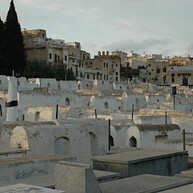 As this is one of the oldest cemeteries in Morocco, you will find here Rabbi Vidal Hasserfaty, who died in 1600 already. 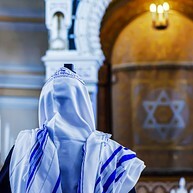 In the southwest corner of the Mellah, and past the Habarim Synagogue, Ibn Danan is an intimate synagogue with a fascinating atmosphere and a traditional ritual bath in the basement. Head here for getting an authentic feeling of religious experience. The Royal Place is a graceful building with an impressive facade of 80 hectare, and its seven 80 feet high doors symbolise the seven days of the week. Although the palace is not open to public, it is worth the visit for an astonishing view onto itsoutstanding structure. 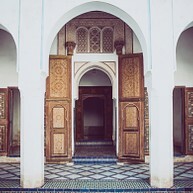 Located in an a century old Spanish-Moorish palace, the Dar Batha museum features a unique collection of traditional Moroccan arts and crafts. 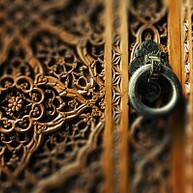 Made out of wood, iron, plaster and other material, these art works will definitely impress you. Belghazi is a private museum housed in a 17th-century palace, whose collection nearly rivals the one of Dar Batha Museum. As many of the items on display are actually for sale, do have a proper look for taking home a really unique souvenir. At the top of Talaa Seghira, in Old Fès, this conveniently located hammam is one of the tourists' favourite Arabic spas throughout Medina as foreigners will also feel comfortable. Please note that men and women are allowed in at different times so do check upon your arrival. 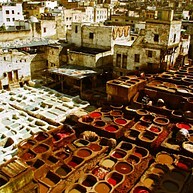 This famous tanneries produces, among the three tanneries in the city of Fès in total, some of the finest leather in the world, using century old practices and also best materials. Find out more about the interesting procedure by visiting the sight in the oldest medina quarter, and by probably purchasing a souvenir. Although dramatically advanced in their state of ruin, some of the ancient tombs and the 16th-century fortress remain their fine original decoration, and they spread a most impressive atmosphere. Best climb up at dusk for enjoying a dramatic and breathtaking view over Fès but keep in mind to head back early as the path is not featured with light. Nejjarine Museum features wooden arts and crafts in a lovely, and well preserved building that, all alone, is already worth the visit. 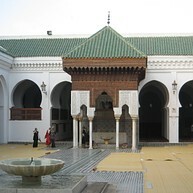 The museum shows the importance of art craft in Moroccan history, and it provides you with a funded understanding of the country's history in general as well. The Attarin Medersa, a former koran school, might not be the biggest one in town but, instead of an impressive size, quite stunning for many reasons. The different tiles in lovely colours, and the overall architecture design make for a place that is a must see on your itinerary. If you are craving a break from the bustling energy of Fès, then this little sanctuary is a perfect get away: the gardens are beautiful with French influence, and a lovely waterfall that invites you to stay at least for a bit. 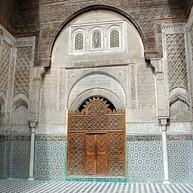 Fès has many beautiful buildings, and the Karaouine Mosque is definitely one of the most impressive ones. While the University of Al-Karaouine is located at its mosque, established in 859, there are also beautiful embellishments and decorations to discover. At one time or another, you will pass through Bab Bou Jeloud, The Blue Gates, and it is highly recommended to get a guide that shows you around while explaining the gates' history. In this area, you will also find many restaurants to go to for lunch, or for just grabbing a cooling drink. 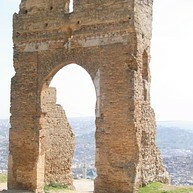 Experience the impressive gates of Fès, as they will provide a great view of the city, and also memories of keyhole-perspective pictures taken at these very places. Pass both ancient and recent ones, on a walk from Bab Mahrouk (13th Century) to Bab Chorfa (14th Centure) and Bab Boujeloud (20th Century), and do also take in the peculiarities of the Old Town. This 20th Century palace was built by the Pasha of Casablanca, and it is both a great example of Moroccan architecture and a popular movie setting that also hosts music festivals. 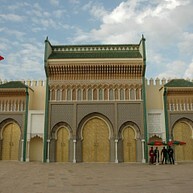 Although the palace is not open to the public, its great décor and outside appearance are well worth a visit.